No single maintenance technique preserves and extends the life of your pavement as effectively as asphalt crack sealing. Stay ahead of cracks through annual maintenance and eliminate high dollar repairs that result from defective asphalt pavement. American River Striping offers a well-tested, effective and economical way to address asphalt crack repair for property management companies, corporations and a wide range of industries. Cracks that appear in properly constructed asphalt pavements are usually due to repeated temperature fluctuations that occur with the change of the seasons. One of the great strengths of asphalt pavement is that it can expand and contract with temperature changes without incurring damage. As asphalt ages, however, the liquid asphalt binding the aggregate together begins to dry out and lose flexibility. 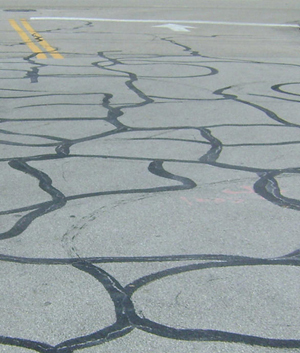 This is the most common cause of cracks and a natural part of the life of any asphalt pavement. Cracks can also form due to structural failure or other problems resulting from improper installation of the pavement. These types of cracks can be avoided, but only through proper asphalt pavement installation from the beginning. If dealt with quickly and effectively, however, even these types of cracks can be managed to help delay a total asphalt replacement for years. Our team of experienced asphalt crack repair specialists can accurately identify the particular problem that causes any asphalt crack and offer the right solution to keep asphalt cracking at bay. American River Striping’s high quality materials and workmanship allows our asphalt maintenance teams to successfully manage asphalt pavements for any job. Contact American River Striping at 866-592-3356 or fill out the on the right for a free, no obligation consultation on your next asphalt crack repair project.